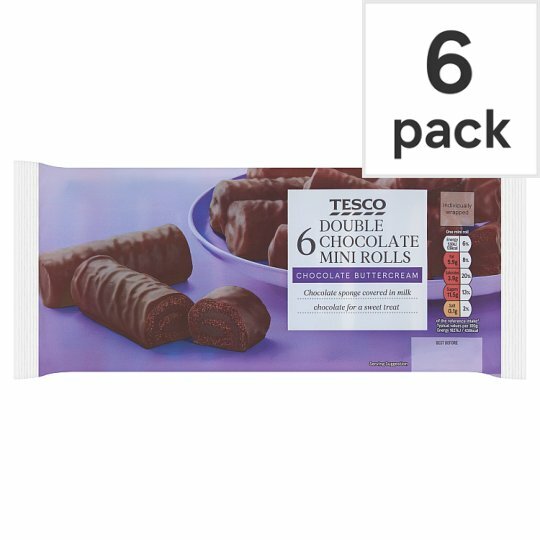 6 Chocolate flavoured mini rolls filled with chocolate flavoured buttercream, covered in milk chocolate. Chocolate Flavoured Buttercream (32%), Milk Chocolate (32%), Wheat Flour, Sugar, Pasteurised Egg, Glucose Syrup, Soya Flour, Humectant (Glycerol), Fat Reduced Cocoa Powder, Whey Powder (Milk), Palm Oil, Potato Starch, Raising Agents (Disodium Diphosphate, Sodium Bicarbonate), Emulsifiers (Mono- and Di-Glycerides of Fatty Acids, Polyglycerol Esters of Fatty Acids), Preservative (Potassium Sorbate), Flavouring. Chocolate Flavoured Buttercream contains: Icing Sugar, Butter (Milk), Glucose Syrup, Humectant (Glycerol), Fat Reduced Cocoa Powder, Salt, Emulsifiers (Mono- and Di-Glycerides of Fatty Acids, Polyglycerol Esters of Fatty Acids), Preservative (Potassium Sorbate), Flavouring. Milk Chocolate contains: Sugar, Cocoa Butter, Cocoa Mass, Dried Skimmed Milk, Milk Fat, Shea Fat, Palm Oil, Sal Fat, Emulsifiers (Soya Lecithins, Polyglycerol Polyricinoleate), Flavouring.